"What men call the shadow of the body is not the shadow of the body, but the body of the soul"
Art is such a subjective medium. This fact isn't lost on me as I write reviews of books each week. Details that I may view as valid criticisms of a certain work may be the very same details that garner another person's acclaim. With that in mind, I carefully craft each of my reviews with a respect for the author's work and an understanding that I'm only one opinion in a sea of many tastes and interpretations. 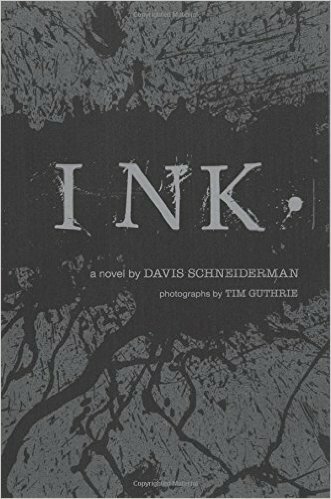 This has never been more apparent than in my review of Davis Schneiderman's latest conceptual novel INK. It is a novel that is nearly impossible to explain. In fact, it is one of those works that begs more to be pondered and experienced than to be reviewed or summarized. INK. is a novel that you study and take in, not read. As the author explains, " INK. is dark, a series of patterned smears over every surface of the book." Each page contains a unique pattern of ink that begs to be interpreted by the individual reader. Comparable to the abstract Rorschach blots, the art in this work requires an open mind to achieve a true appreciation. I found myself working through the book for several days. Each time, a new subtle piece of the work would reveal itself to me. The most striking pages contain photos of people that have been redacted by the pervasive ink. The figures of those pictures are made into black shadows containing secrets that may never be known. Throughout 200 pages, INK. and author Davis Schneiderman challenge readers to access their innermost emotions and perceptions. While some may find this book difficult to digest, I would urge you to give it a chance. You may be surprised to discover the secrets this stunning achievement holds. This entry was posted on Wednesday, February 24, 2016 and is filed under Abstract,Art,Book Review,Concept Novel,Davis Schneiderman,Dead Books,INK.. You can follow any responses to this entry through the RSS 2.0. You can leave a response. Labels: Abstract, Art, Book Review, Concept Novel, Davis Schneiderman, Dead Books, INK.